Saluna is served all over Awan but in different incarnations. This truly yummy dish is the product of several influences. Years ago my husband, Alan, took the Trans-Siberian railroad from Irkutsk to Moscow. Every time the train stopped, the dining car was changed. And every time the dining car changed, the borscht changed. We in the US think borscht is cold beet soup, but in Russia borscht is soup that can be served hot or cold and is prepared in many different ways according to local customs. This story reminded me of barbecue in the American South, which changes from state to state. I love this idea, so I decided to develop several dishes that would be served all over Awan but would differ from tribe to tribe and region to region. One such dish is saluna, sweet-and-sour fish. On Earth this is an Iraqi dish. I found a recipe for it in the Sephardic (Mediterranean Jew) section of Claudia Roden’s The Book of Jewish Food: From Samarkand to New York. Alan and I used this as inspiration to create Awan versions. Today’s saluna comes from northeastern Uriyana. This recipe shares no ingredients with the Iraqi recipe I found. Instead it uses ingredients available to the Uriah tribe. Lucky for Alan and me, all of the ingredients are available in Portland too. Heat a frying pan on medium high. Add pumpkin seeds to the hot, dry pan. Swirl the seeds around the pan until toasted. Remove seeds from heat and set aside. Place a large saute pan on medium high for several minutes. Add oil to pan and turn the heat down to medium low. Add onion, celery, carrot, and fennel. Cover the pan and sweat the vegetables until soft for about 3-5 minutes. Add tomatoes and currants, cover pan, and cook for 3-5 more minutes. Add cider vinegar and maple syrup. Simmer covered for approximately 5 minutes. Season fish with sea salt and freshly ground pepper. Add fish to pan, cover, and simmer on low so the fish cooks gently in the sauce. Simmer for approximately 5-7 minutes, until the fish is just done. Remove the fish and set aside. Season the sauce and vegetables to taste. 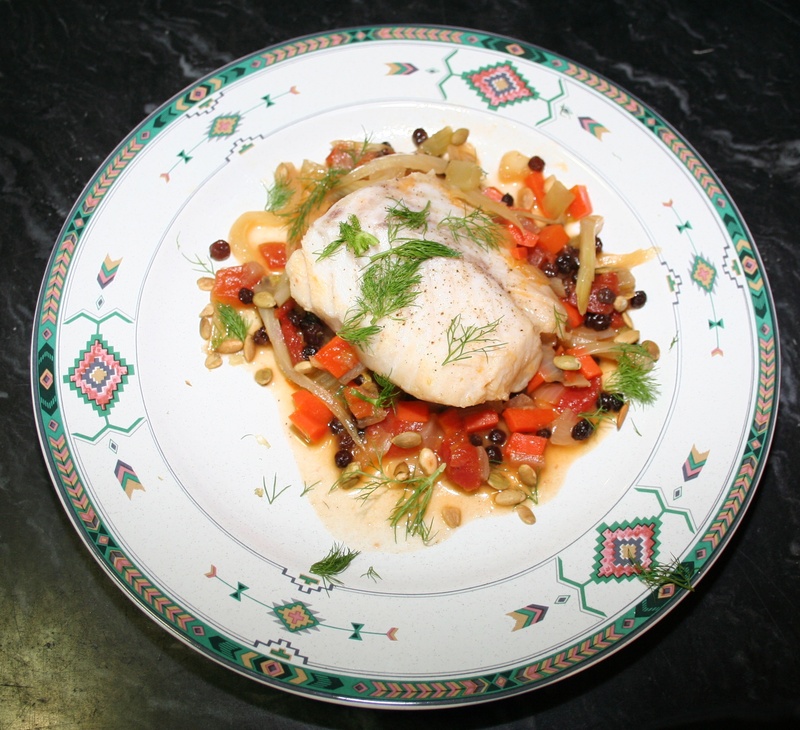 Place a large spoonful of the sauce and vegetables in the center of each plate and place a piece of fish on top. Sprinkle pumpkin seeds and fennel fronds around each plate and over the fish. Serves Four to Six.